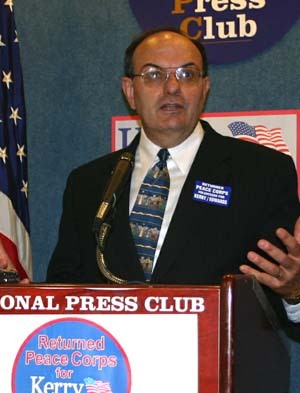 The PCOL Interview with Dave Magnani, Founder of the "RPCVs for Kerry"
Introduction: On October 16, 2004, PCOL interviewed Massachusetts State Senator Dave Magnani, Founder of "RPCVs for Kerry" and talked to him about Peace Corps issues and the candidacy of John Kerry for President. IPCOL: Can you tell us about your service as a volunteer and your career as a legislator? Dave Magnani: I was a Peace Corps volunteer in Sierra Leone from 1968 to 1971. I was involved in teacher education particularly helping teachers with science education. Then I was Peace Corps staff towards the end of '82 with my fiancé who then became my wife who was also a Peace Corps volunteer before we went to Kenya. I was involved in the National Peace Corps Association for a long time since then and joined the legislature in 1985 as a State Representative in Massachusetts then became a State Senator in 1992 so I am in my twentieth year as a legislator now. PCOL: I understand that you have authored legislation in Massachusetts that provides benefits to volunteers. Can you tell about that legislation? DM: Sure. As a matter of fact I was talking about this with the Peace Corps Director yesterday as a model for other states. In Massachusetts we passed a law that would require that school systems that have teachers currently teaching in them would be required to allow a teacher to go overseas and teach for two or three years in the Peace Corps and come back with a guarantee that their job would be available to them or a comparable job when they returned. We are the only state that has such a law. In addition we passed subsequent legislation that would allow the teacher to receive creditable service towards their retirement for the years for which they are in the Peace Corps. That has been enacted and as a matter of fact last night I ran into a couple of teachers who had just benefited from that provision. Director Vasquez indicated that he thought it would be helpful to get other states to do that because it is particularly helpful in recruiting experienced teachers to go into the Peace Corps. PCOL: What is your role in the Kerry campaign? DM: I don't have a formal role. I actually decided on my own that Returned Peace Corps Volunteers would likely be supporters of John Kerry if they got to know more about him. They have something in common with him and would have a reason for supporting him for President so I began the process of reaching out to them as a former volunteer to support the Kerry campaign. I have pretty much been doing that for eleven months. As I said, I don't have a formal role and am not a paid staffer with the campaign. PCOL: But you are someone that the campaign listens to on Peace Corps issues and other international issues? DM: John and I have worked together for twenty years on a variety of issues. He knows about my Peace Corps service and commitment, and we became much more connected regarding Peace Corps when John became a Senate activist to pass the Blood Diamond legislation in 2000. PCOL: Tell us more about the Blood Diamond legislation and other issues you have worked together on with John Kerry. DM: I worked with John on early childhood education, something that is very close to his heart and to mine. We worked together to create an integrated federal and state relationship on early childhood education so that the federal government would support state initiatives on early childhood. John was the ranking member of the Senate Foreign Relations Committee in 2000. I was active in starting something called the Sierra Leone Cultural organization here in the Boston area with a group of Sierra Leoneans who were trying to promote a better image of Africans who were trying to live in the United States but who were still African citizens. The Ambassador from Sierra Leone actually has a house here in Massachusetts and he and I discussed what was going on in the war in Sierra Leone at some length. Finally I suggested that he might want to come to Washington to Senator Kerry's office and I asked the Senator if he would host a meeting with myself and the Ambassador with the head of the Africa desk from the State Department to hear what was going on in Sierra Leone in the civil war. This was late 1999 that John agreed to host a meeting. When he heard the kind of atrocities that the rebels were perpetrating on the Sierra Leone population and when he heard that the munitions were coming from the sale of illegal diamonds that the rebels had captured in the diamond area, he became very, very concerned. It was later reported that al-Quaeda was involved in the arms-for-diamonds trade. I then worked with the Friends of Sierra Leone to hold hearings on the blood diamond trade. Senator Kerry crossed the mall and came to a House hearing on the diamond legislation. It was very unusual for a Senator to come to a House hearing of the House International Relations Committee. We had eight children and young adults from Sierra Leone who had had limbs amputated during the civil war come and testify as to why the blood diamond legislation was necessary. It was a very compelling experience. Senator Kerry testified on why the blood diamond legislation was necessary, and then ultimately helped get it passed and signed before President Clinton left office. 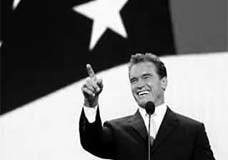 The blood diamond bill was implemented and the arms trade dried up and shortly thereafter the war in Sierra Leone was over within about a year. Obviously there were other factors, but The Sierra Leone Ambassador John Leigh believed the bill was an important factor. Senator Kerry knew there was absolutely nothing to be gained by taking this initiative but did it simply because it was the right thing to do. It was clear to me that John Kerry was someone who had real passion for people in developing countries and for people who were victims, regardless of whether they were Americans or people who lived overseas. He had enormous respect for the Peace Corps. He knew that my own passion and understanding on the issue came because I had served in the Peace Corps. Teresa Heinz simply augmented that support and that commitment because of her international experience. She was born in Africa and had a real understanding of what Peace Corps could do overseas, so there was a strong commitment to such issues and it certainly solidified my support for John and my connection to him relative to My Peace Corps experience. PCOL: I have heard some volunteers say that this may be the most important election in our lifetime. Why do you think RPCVs should support John Kerry in this election? DM: There is no way in the world that any Americans can feel safer if the world increases its hatred for America and for Americans. We cannot use arms alone for America's security. Military might and aggressive threats simply cannot make us safer if the rest of the world grows in distrust and suspicion for America and by extension for Americans. Peace Corps volunteers understand that better than anyone. They also understand what it takes to build friendships and connections for Americans and for our country overseas. We are not fighting a country when we are fighting terrorism. We are fighting a violent approach to ideological advancement on the part of people who can't perpetuate their model of war and can't operate their terrorist cells without support and cover from inner cities and small villages all over the world. It seems clear that the more villages terrorists find in which America's reputation has become degraded, the easier is it going to be for them to find recruits and havens for the creation and growth of terrorist units. So I believe that there is a direct connection between Peace Corps work of making friends for America and the work of protecting Americans from terrorism. Peace and security through service, as I suggested in my remarks to the twenty-fifth re-union of the Peace Corps. Such an approach will never be able to replace the role of the military, but it must play a significant role in augmenting, and some day, even reducing the necessity of it. PCOL: I'd like to move on and ask you some specific questions with regard to the Peace Corps and what you think John Kerry would do as President with regard to the Peace Corps. My first question is about the Peace Corps budget. In February 2002 President Bush proposed doubling the size of the Peace Corps and proposed annual 15% budget increases over a five year period to make that happen. In actuality there was only a single 15% budget increase in the first year in FY03 and subsequent increases in FY04 and FY05 have not occurred. John Kerry has proposed tripling the size of the Peace Corps and says he will "make it happen." What makes you think that John Kerry would be able to get the budget increases through Congress that President Bush has not been able to make happen for the past two years? Why should Returned Peace Corps Volunteers think Kerry would be any more successful than President Bush in getting these increases enacted? DM: It is an excellent question. Before I answer it I want to make it very clear that I cannot authentically speak on behalf of the campaign itself because I am not a formal member of the campaign organization and therefore I am speaking as an individual who knows John quite well, who knows the way he thinks about foreign policy issues and I can make strong and relatively predictable speculations about what John might do but I want to be clear that I am not in a position to speak on behalf of the campaign. Having said that, for the reasons I have already indicated, I believe I know the answer to the first question. As you know John has already promised to triple the size of the Peace Corps and I think the reason this is a more important promise than the one the President has made to double the size of the Peace Corps is that John will make it a priority. Usually, when a President sets a priority, he can make something happen. He can establish his priorities with Congress and I believe John Kerry will make it more of a priority than has been made in the past. The past two budget cycles have seen the Peace Corps budget cut below the requested amount, in spite of the growing demand for volunteers, with some 27 new countries requesting volunteers, and a growing number of applicants. PCOL: There have been two Returned Peace Corps Volunteers who have been Directors of the Peace Corps - Carol Bellamy and Mark Schneider - both appointed by Bill Clinton. Former Congressman Tony Hall said in a recent interview that he thinks it is important that the Director of the Peace Corps be a returned volunteer. Do you agree and do you think that President Kerry will appoint a Returned Peace Corps Volunteer as director? DM: We have had outstanding directors who have not been Returned Peace Corps Volunteers. Having said that though, I believe that a person who has served in the Peace Corps will have a much deeper understanding of the volunteer experience and will be able to relate much more directly and personally to the concerns and aspirations of volunteers on the ground. Therefore, I share that commitment and I am confident that we are much more likely to see President Kerry appoint a former member of the Peace Corps as the director, particularly if the NPCA were to make it a priority for the next administration, which I suspect it will. PCOL: You know there are twenty-two political appointee positions at Peace Corps Headquarters and under this administration only three of them have been filled by Returned Volunteers. Do you think if Kerry is elected President he will appoint more Peace Corps volunteers to key positions at Peace Corps Headquarters? DM: I think he would, for the reasons that I stated in answer to your previous question. I have watched John Kerry with regard to other issues like early childhood education, bringing early childhood teachers into the policy making process. This indicates a willingness to listen to those people "in the field" who have had the relevant experience when it comes to the operation of an agency. So, by precedent, I think the answer would be yes. PCOL: A few days ago the "RPCVs for Kerry" had a press conference at the National Press Club in Washington that I attended and one of the speakers for Kerry was Paul Oostburg Sanz, a returned volunteer who works in the office of Congressman Tom Lantos, the ranking member of the House International Relations Committee and co-author of the "Peace Corps Safety and Security" bill that passed the House earlier this year. I'd like to ask you a few questions about some of provisions that are in that bill and see what your position is on them. Do you think that President Kerry would support the provision of this bill to create an Ombudsman at Peace Corps? DM: I believe he would be most sympathetic. Again, I can't speak directly, but it is the sort of thing that goes to the heart of serving the volunteer and the volunteer's family. From what I have seen in the way in which John Kerry responded to the constituency of which I am more aware, which is the early childhood constituency, he involved people directly in the operation of those agencies for which they had the most expertise. I would think that that would bode well for his commitment to an Ombudsman. I really can't imagine why anyone would resist it. It seems to be an obvious response to the need for individual volunteers to have a voice in the way the agency that administers their support systems operates, so that it will continue to be a progressive and responsive agency. PCOL: Do you think President Kerry would support the legislation for the independent appointment of the Peace Corps' Inspector General as recommended by the GAO? DM: I would think yes, and for the same reasons, but again, it is simply good management. You have to have some kind of independent oversight and an Inspector General simply cannot do the same job if he or she is appointed by the same agency over which they are supposed to exercise oversight. PCOL: What about the five-year rule? This administration has supported legislation that provides exceptions to the five-year rule for employees who work in safety and security and some people say that this is creating a two-tier employment system inside the Peace Corps. Do you think this is a good idea? DM: My understanding is that the exceptions that are written into current law are related to positions of safety and security. These are positions where maybe longer connection to the agency may be necessary so I think there is a rationale for the exception, but I would certainly be recommending that President Kerry take a very close look at this rule and listen to experienced voices of returned volunteers; I believe that he would, on this and on a variety of other issues. PCOL: Would you support a study of the five-year rule to see if it really makes sense to provide exceptions, or if we should go back to original five-year rule with no exceptions, or if perhaps we should eliminate the five-year rule entirely? DM: This has been a source of controversy for such a long time in the Peace Corps community, so it is definitely worth a more formal look than what we have attempted thus far and I would support that. I'm sure John would as well. PCOL: We've published a number of articles on "Peace Corps Online" about volunteers who have returned with long-term injuries or long-term illnesses and experienced difficulties in getting proper reimbursement through FECA. What steps would he take or support to provide better medical support to volunteers with long term illnesses. DM: In this situation you need to have someone who understands the long-term impact of service and volunteers. They don't get the same sort of benefits that veterans of military services do and from my rough calculations volunteers are in at least as much physical risk, oftentimes as people who join the military. And I am not suggesting that that should change, but I think the legitimate health concerns of volunteers from service related illnesses or injuries really need to be addressed whether through FECA or through an independent health care program. These problems need to be aggressively addressed, because volunteers earned good treatment for their service. Also it is going to be more difficult to recruit older volunteers if health concerns are not aggressively addressed. PCOL: This administration was the first to sign a cooperative agreement with NPCA to support recruitment and third goal activities. Would you recommend to President Kerry that he support the continuation or possible expansion of the cooperative agreement with the NPCA? DM: I would definitely make such a recommendation. I think it has worked well and it gives the NPCA a more formal role and appropriate role. It also sets a proper precedent that would allow the NPCA to sign similar agreements with other agencies that deal with issues which returned volunteers face. PCOL: You remember back in the 1960's there was a Peace Corps Advisory Council with Hubert Humphrey, Harry Belafonte, and I believe, with President Johnson as the honorary chairman. It took quite an active role in making recommendations to the Peace Corps on the directions it should take. The Advisory Council was allowed to more or less languish in the 70's and eventually disappeared. Do you think that the Peace Corps Advisory Council should be re-activated and would you make that recommendation to President Kerry? DM: Yes, I would make that recommendation to President Kerry and for several reasons. Last night Director Vasquez was explaining that, if the Peace Corps were a private company, thousands of investors would come to invest because the demand for volunteers far outstrips the supply and is restricted only by its budget. I think that the Advisory Council served an important role not only by giving advice from people in a variety of professions but it would serve as a strong advocate for the Peace Corps with prominent American citizens advocating for the Peace Corps. You know the Peace Corps needs all the help it can get during budget times and I think the Advisory Council could again provide that. PCOL: John Kerry has proposed a "Citizen's Patriot Fund" that would provide four years of state university tuition to anyone who gives two years of service to America. I was wondering how this would work with Peace Corps volunteers who in most cases have already completed their college prior to serving in the Peace Corps. Would volunteers who complete their service be eligible for any kind of benefit under the "Citizen's Patriot Act" that you know of? DM: Again, I haven't spoken to John about this directly but I believe that it should be allowable. Loan forgiveness might be one way of making returned volunteers eligible or, as you know, a significant number of volunteers return to graduate school, so they might well be eligible for assistance with their graduate program under this proposal. PCOL: That concludes my questions. Any final message that you would like to send to the returned volunteer community on why they should support John Kerry for President and what specific actions returned volunteers can take to support John Kerry? DM: I can't expect many RPCVs to understand Senator Kerry in the way I do because I have had such a long and personal relationship on issues that we both care about. But, I can tell them, based on my personal experience that Senator Kerry understands global dynamics as well or better than any member of the United States Congress certainly better than the gentleman who currently occupies the White House because of his twenty years of experience. More years of foreign policy experience than the President and most members of Congress. 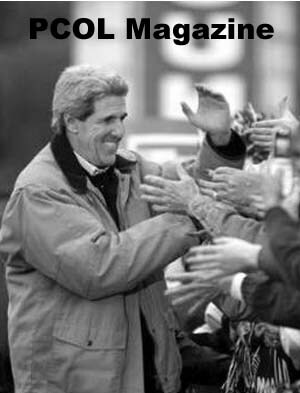 You know people talk about President Bush as being an "experienced hand to the wheel," forgetting that Senator Kerry has far more foreign policy experience than the current President does, not only in terms of not the variety of countries with which we are engaged, but also in terms of the number of issues he has had to deal with over the years. So, certainly in terms of expertise he would make an extraordinary President. Equally important, his own proclivities and beliefs. In addition, Teresa Hienz has consistently articulated her strong support for Peace Corps on the national stage of the campaign. She herself is an internationalist by experience and by birth. I believe she will consistently articulate positions that will resonate with the Peace Corps approach to solving problems. John Kerry clearly understands America cannot simply be safe, cannot serve its role as a world leader, cannot elevate the lives of the most vulnerable citizens of the world unless America is respected - not just feared, but respected across the globe and John Kerry, perhaps better than anyone who was a candidate this year, understands exactly what role Peace Corps can play in building authentic friendships for America and for Americans. Without that, no amount of guns, money, threats or military might is going to make Americans safe in a world in which it continues to lose international respect and support. On issues like world debt relief and other issues that affect developing countries, I strongly believe that John will be an outstanding President. I know that those around him would encourage him to be no less when it comes to broader foreign policy. It is absolutely outrageous that the United States has gone from being, during the Carter administration, the most generous nation in the world, as a percentage of its GNP that it gave to non-military foreign assistance, to being last in the industrialized world today. To have made that shift, I think, has to be at least one of the reasons why so many pockets of hatred for America have emerged around the world. I believe John Kerry is the best person to reverse that trend. The current administration simply doesn't seem to grasp the enormity and importance of the trend. So, if folks agree with me on that, there are two weeks within which to change the world, they must get involved in the campaign now, like they've never been involved before. Many RPCVs are already working hard for John, but if you want top be part of the crucial last push, please contact your state Democratic party or local Kerry headquarters and ask to get involved with the get-out-the vote campaign, in your own state, but particularly, regardless of where you live, in the swing states of Minnesota, Iowa, Wisconsin, Pennsylvania, Ohio, Nevada and Florida. They should use the phone book or contact the Kerry State Directors or from our web site at www.rpc4kerryedwards.org/ Failing that, can contact me directly at davemagnan@comcast.net. If they have cellphones with free weekend minutes they can help us in swing states by just linking to KerryVolunteers through our web site. We will make sure that they are given every opportunity to help elect a "Peace Corps style" President, John F. Kerry! PCOL: Thank you very much for answering our questions. DM: Thank you, and keep up the important work you do with Peace Corps Online. I wish to add that Senator Kerry, along with Senator Kennedy and Congressman Meehan, have been intrumental in keeping Peace Corps' attention focused on my son's disappearance in Bolivia, back in 2001. I do not agree with him or President Bush in their efforts to exponentially increase the number of Volunteers until all aspects of safety and security have been addressed and Volunteers have a Ombudsman to speak for them when contentious issued develop between the Volunteer and Peace Corps. I also will continually lobby for an independent Inspector General's office for Peace Corps. I am currently researching and writing book on the first PC group, Colombia One. To date, my investigation reveals an extraordinary high level of support for Kerry even among those who are conservative Republicans. One reason for the discontent with Bush is his disasterous handling of foreign policy, the war and his return to a bullying, arm twisting approach in our relations with other nations. As Dave points out in his interview, Bush has hardly tapped the experience of ex-PCVs in his appointments to the Peace Corps and this, rather than his statements tell the story. I believe that with Kerry in the White House, RPCVs would have a stronger voice in influencing the direction of foreign policy and urge others who share this view to get involved in the campaign. Howard Dean became the DNC chair today. It is a break through, a quiet victory for all the Dean Supporters who know Howard should have been the nominee and the President.